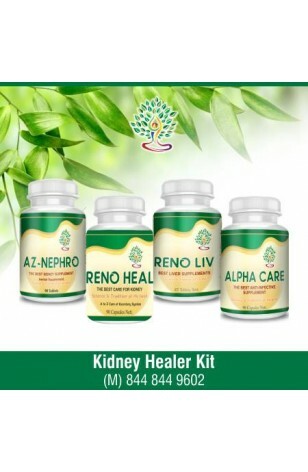 Renal care kit is a special combination of herbal products which reduces the risk of kidney failure. Az Nephro is our niche product for avoiding dialysis. Renoliv is another ayurvedic product which increases the glomerular filtration rate. The main job of the kidneys is to separate waste products. They absorb what is required and take away the waste in weewee. the foremost important waste products are excess sodium and water. Each kidney contains a couple of million filtering units referred to as nephrons. They eliminate wastes from the body, regulate the degree and pressure of blood, and control levels of electrolytes and blood acidity. Chronic renal failure (CRF) is that the progressive loss of kidney operate. The kidneys plan to make amends for renal harm by hyper filtration (excessive straining of the blood). Over time, hyper filtration causes more loss of operate. We from Ayurveda Yogashram provide a Renal care kit which increase the efficiency of the kidney. It as a result provides best Ayurvedic treatment for kidney care. With this urine output is increased. And in thus filtration power of kidney is increased. By this method with these combinations level of blood urea and serum creatinine start to decrease with in 30 days. No side effects at all. All medicines are approved by the government of India. - The urine output start increasing day by day. - By using Renal care kit, the normal functioning of kidney being started. - The increased values of Blood Urea and serum creatanine start going to decrease within 15 days. - The albumin excretion comes down to normal values. - Swelling on different parts of the body starts to decrease.